In January, we told you all about Kelly, the dog rescued — likely just days from death — on Utah’s unforgiving Bonneville Sand Flats. 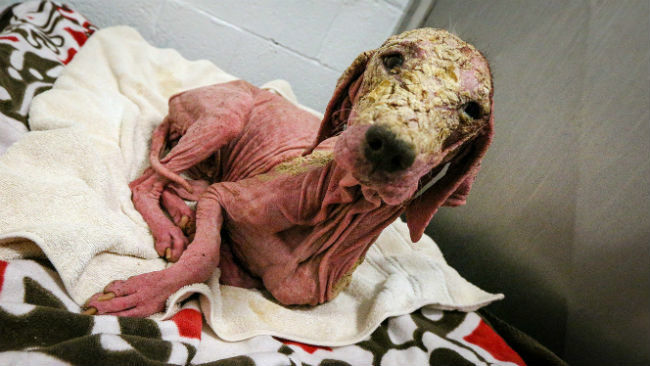 Kelly was in such bad shape — malnourished and covered in sarcoptic mange to the point of scaly baldness — when a good Samaritan found her and brought her to where she could get the help she needed. Kelly, so named by the staff at the Utah Animal Adoption Center, has since been awash in love and recovering beautifully. And the world beyond the clinic staff has been watching and sending love (and toys!) every step of the way. Right out of the gate, though, people wondered what breed or breeds she might be. Without fur, it was just about anyone’s guess. And now DNA tests have given us all the answer: Kelly is 100 percent Brittany spaniel! This was fun for those speculating, since the Utah Animal Adoption Center held a contest where fans made their best guesses — at least one person, FOX13 reported, was correct! We wish Kelly continued success in her recovery as she gets healthy and ready for a forever home.